First start with a folded A5 card blank. I used one in very vanilla. 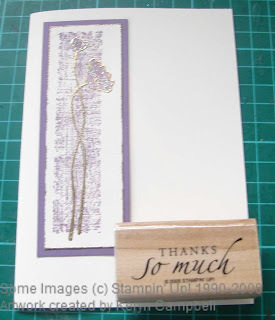 Put your card blank away for later and grab a scrap of card the same colour. 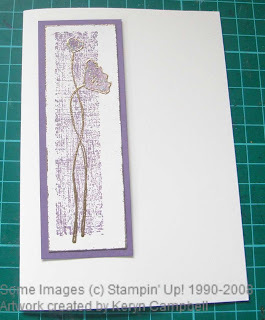 I then stamped the background stamp from Stampin’ Up!®;s ‘Oh So Lovely’ Stamp Set on my card scrap in Perfect Plum Ink. 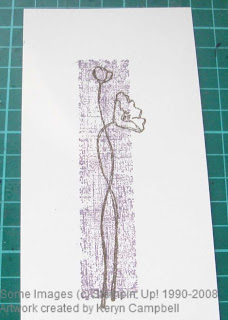 I then choose one of the flower stamps from the same stamp set and stamped it in versamark ink over the background image. Make sure the background image is very dry before you do this. As versamark ink is clear there was nothing to see in a photo. 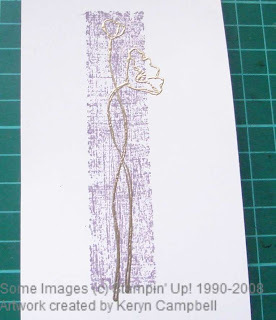 I then folded a scrap piece of copy paper in half placed my stamped image on top of it and tipped rather than sprinkled gold embossing powder over the image. 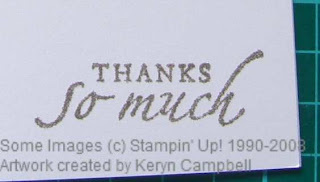 Tip the embossing powder off the stamped image and tap the back of the cardstock to get rid of stray specks of powder. 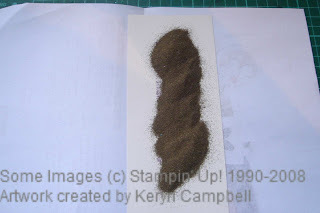 At the same time use the folder piece of copy powder to funnel the excess powder back into your container. Hold your heat tool over the image on a heat resistant surface, I used my ceramic cook top, until the image turns shiny and raised. Move the heat tool slowly until the entire image has turned. Using my Fiskars Paper Trimmer I lined up the edge of the background stamp against the inside edge of the blue bar and then cut. Placing the cut edge on the bottom bar I moved around the image lining up the edge of the image against the inside of the blue bar. Next run the edges of the cardstock through your versamark ink pad and then through some gold embossing powder poured onto your copy paper. Cook the embossing powder with your heat tool as before. Watch your fingers this time. 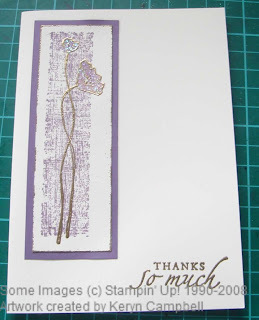 Adhere your stamped and embossed card onto a larger piece of coloured cardstock to mat it. I’ve used perfect plum to match my ink. 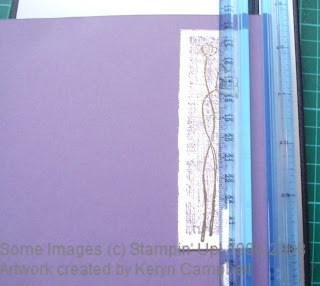 Then using the paper trimmer I lined up the edge of the vanilla card with the inside of the blue bar and cut the perfect plum card. 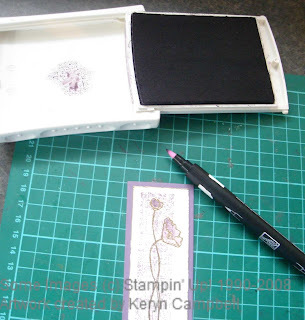 To add a little bit interest to the flowers I pushed the lid of my perfect plum inkpad into the ink and using a blender pen used this ink to colour in the flowers. Then to add even more interest I coloured in the flowers again but this time with a glue pen. Then place your cardstock onto another piece of folded copy paper and pour over microfine clear glitter, I used dazzling diamonds. 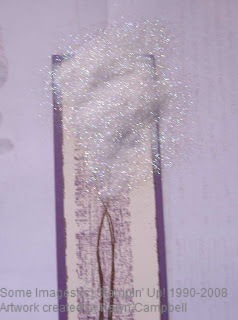 Tip off the excess glitter into the copy paper and funnel back into your glitter container. 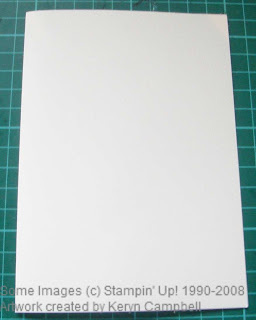 Place your decorated cardstock onto the top corner of your very vanilla cardstock but don’t stick down yet. 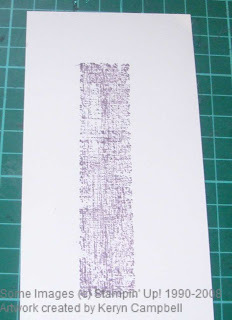 Stamp your chosen word stamp with versamark into the bottom right hand corner of your card. 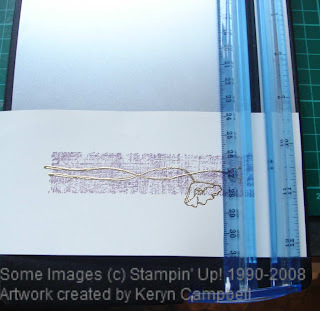 Cover with gold embossing powder as before. 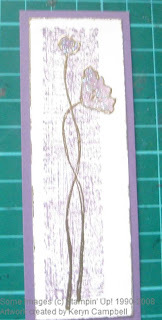 Heat embossing powder as before. Adhere embellished cardstock piece to top left corner of card blank and you’re all done. I would love to see any projects you’ve created using heat embossing, or colouring with ink and a blender pen or using microfine glitter. 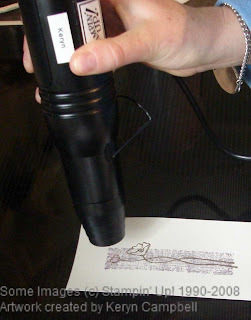 If you do not have access to a heat tool it is possible to turn embossing powder over a toaster. Just press the button down as tho. you are cooking your toast and hold the cardstock over the top of the very hot toaster. Don’t burn your fingers.